The wild black cherry tree (Prunis serontina) is an indigenous North American tree which will grow to between 60-90 feet tall with lightly serrated, shiny, dark green leaves. Growing black cherries have low branches which tend to droop and brush the ground. Growing black cherries are conical to ovoid in shape. These rapidly growing deciduous trees turn beautiful shades of yellow-gold to red in the fall. Wild black cherry trees also bear 5-inch long white flowers in early spring which turn to tiny but juicy, reddish black edible berries during the summer months. A vast array of caterpillars enjoy munching on the wild black cherry too. In turn, the animals serve to aid in the propagation of wild black cherries by evacuating the seeds and dropping on the forest floor. Note: if you don’t want the above animals in the landscape, steer clear of wild black cherry trees. 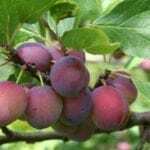 The fruit may also be used in jams, jellies and liqueurs. 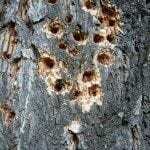 Additional information on wild black cherry trees is in regards to its fragrant, but bitter, inner bark being utilized in cough syrups. Further wild black cherry tree information points to its use as a highly prized wood since colonial times in the creation of fine furniture. Intrigued? So, I guess you’d like to know how to grow a black cherry tree. First off, growing black cherries are hardy to USDA zones 2-8. 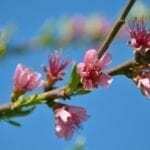 Otherwise, the black cherry tree’s requirements are relatively simple. The tree prefers some sun exposure but is most often found in the wild as an understory tree, living beneath the canopy of forest and hence often in shadow. Black cherry trees will tolerate a variety of soil media. Before transplanting black cherry trees, however, keep in mind that the tree is quite messy. The dropping fruit tends to stain concrete and the remaining seeds can be treacherous for anyone walking beneath the tree. While the wild black cherry tree is considered by some to be almost a noxious weed since it easily propagates via seed dispersal from animals, if you have decided that you would like a specimen in your yard, the easiest method is transplanting black cherry trees. The trees can either be harvested from out in the natural forest, or for more disease resistance, better purchased from a reputable nursery. Consider the location carefully with attention paid to potential staining, probably not near walkways or pavement. When transplanting black cherry trees has been completed, be sure to keep weed free and mulch heavily around the base to maintain moisture retention around the root ball. Once established, do not transplant again as the root system is fairly shallow and to do so may damage the tree irrevocably. With the exception of the dreaded tent caterpillar that can decimate the leaves entirely, growing wild black cherry trees are resistant to most pest and diseases.